The Clan was founded on November 17th 1967 by Davie Graham, who, with the help of Sean O’Connor-Parsons and Vince Moroney, entered two teams into the Edmonton Rugby Union. One team would be in the First Division, and one in the newly formed Second Division. Most of the players recruited to the Club were absolutely new to the game, and, after all that time, some are still with us! That first season, 1968, we were on the losing end of most games but we did win the Edmonton Sevens Tournament. The history of a very successful rugby club had started. The 70’s saw us take possession of the legendary “Grottie Towers”, a three storey building in downtown Edmonton. A Clan member, Bob Campbell, was waiting to develop the property so he let us have the building for free! The use of a clubhouse certainly helped develop the Club and create a few legends. We went on to create “Grottie Two” and “Grottie Three” before buying our present Clubhouse at Airways Park from the Edmonton Optimist Club in 1982. We arranged for the use of the surrounding fields with The City Parks Department and indeed established an underground sprinkling system on the main field along with a major upgrading of the field and the building. An addition to the Clubhouse includes changing rooms and showers for all Clan teams as well as visitors. There is also an upper room, complete with wet bar and deck. This is referred to as “The Bear’s Den” in honour of it’s major patron, has become the haunt of the old boys. In 1983, The Clan became the only Club ever to win all three Edmonton Championships and then went on to become the only Club ever to win all three Alberta Championships in the same year! A Clan-slam! 1998 saw us add a women’s team to the Club. We have also toured Australia, Europe, Ireland, Scotland, England, Wales, Bahamas, Australia and New Zealand plus numerous short tours to the USA. The Edmonton Rugby Union has not suffered from a lack of Clan members filling Executive Offices, and the Referee’s Society can count on many members from our Club. We also had the first Albertan to play professionally, Danny Baugh (Clansmen, Alberta, CCSD and Canada), who played for Cardiff in The UK. The Clan has been blessed over the years with members who have supported the Rugby ethic by involving themselves in all the important off-the-field activities that make the playing successes possible. We can use people of all ages, sizes, shapes, who are interested in maximizing their own Rugby potential, be it in playing or organizing. Someone like you perhaps? Rugby does not only create character, it also discovers it. A thousand Highland welcomes tae ye! The Edmonton Clansmen Rugby Club is the only club located in central Edmonton. Being in the heart of Edmonton, we strive to share the love of rugby with others. Our club is involved with many projects, including rugby nights at the Boys and Girls Club to volunteering with the Ronald McDonald House and gathering food for the Edmonton Food Bank. If you would like to partner with the Clan and help give back to the community, please contact us by sending an email to clanrugbymembership@gmail.com. "This event is put on by the We Care Group. They are the one's who are there every Sunday morning. We Care was started up by the Sherwood Park Alliance Church. They have since been joined by three other city churches of different denominations. They are sponsored by Costco and Safeway and provide food, clothing and bus passes etc for people in need (many are working poor and not homeless). Once a year they put on a Christmas dinner donated by Elizabethan Caterers. They used to always do that dinner outside in the cold until we agreed to provide the use of our clubhouse. Having a warm place to sit down and eat allows the people in need a chance to truly enjoy and appreciate the kindness provided to them. We helped feed more than 190 people on Sunday which is similar to the past four years. This was the fifth year we have supported this event. Every Sunday they provide support to around 100 people. I believe it is important to be proud of an organization you can be proud of. Being socially responsible and having a positive impact on society are very important attributes to be proud of. The Clansmen Rugby Club does many wonderful things for its membership and this is something else to be proud of as well. Thank you!" ~ Steve Blink, Clansmen Member. To find out more about the We Care group, click HERE. EDMONTON BOYS AND GIRLS CLUB, McCAULAY CLUB - weekly rugby! One evening per week during the fall and winter, our Junior Rugby Director Tamara Kulyk brings rugby to the kids in the inner city. The McCaulay Club is located just north of the downtown core and serves many of the at risk youth in the city. One night per week, Tamara and club members play rugby games in the gym at the club. They serve as mentors and provide a safe and fun atmosphere for the youth to learn about rugby. As a result, we have witnessed many positive relationships with the children at the club as well as some joining our junior program in the summer. For more information, please contact Tamara. Click HERE for information regarding the McCaulay Boys and Girls Club. "FTC - Feed the City" is a Clan initiative to collect food for the Edmonton Food Bank. Our first major food collecting event involved many members of the Edmonton Rugby Union and generated over 200 pounds of food! We look forward to having many more opportunities to collect food for those in need in our great city. Our annual Christmas party, the 12 Bars of Christmas, quickly turned into a sock drive. The members of the Clan challenged each other and this challenge quickly became a lesson in generosity as more than 200 pairs of socks were collected in one evening. These socks will be donated to a shelter in the downtown core. 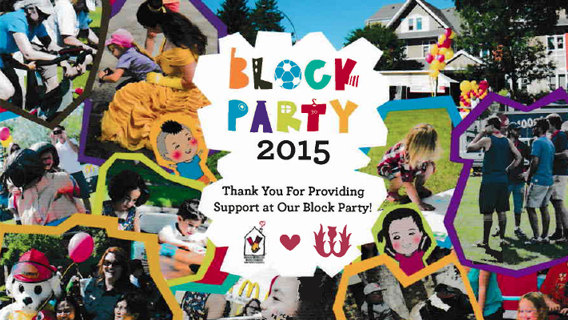 We provided security for the Ronald McDonald House Block Party free of charge. Great fun was had by all who attended! Including a generous donation of $300 from the staff at the Ellerslie Rugby Park, many of our club members have become involved in this wonderful organization. Hearts 4 the Homeless create backpacks filled with necessitities and hand them out to homeless members of our commuinity. If you would like to donate to this program, please contact Amy. To find out more about this organization, click HERE. The Edmonton Clansmen Rugby Club has been built with the help and support of players, alumni, friends, family and community members. We thank you for helping make us the club we are and the club we will be.